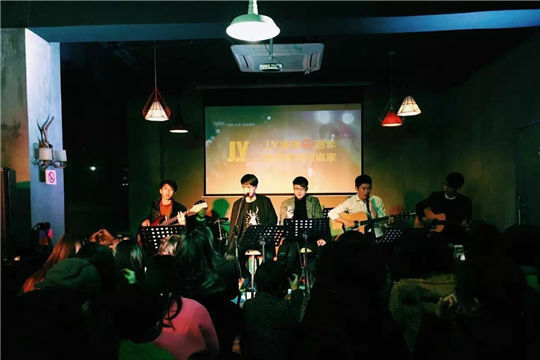 With another four like-minded peers joining afterwards, the group developed into a band composed of six members from Pingtan. In 2011, the six post-90s proposed a candid but encouraging goal, that is, to revitalize Pingtan's music with their efforts. Set in Pingtan, their original song, titled Gujing Waiyuan (Ancient Well in the Outer Courtyard), tells of their childhood memories of the ancient houses in their hometown and expresses their strong affection for music and the city. However, the band broke up as the boys struggled to make ends meet. Some of them chose to stick to the path of music while others departed Pingtan and landed white-collar jobs in other cities such as Nanjing, Xiamen and Zhangzhou. But in February 2016, the six young men reunited after a long separation. To mark the seven-year anniversary of their band, a mini concert was held. Travelling home from the different cities they had moved to, the six band members took to the stage in Pingtan once more. In the small venue, more than 200 concertgoers totally immersed themselves in the beautiful songs sung by the " old boys " as they waved glow sticks to the beats.
" I found nothing had changed among us," said Weng Zhujian, the lead singer of the band. " It seemed like we had never been apart." " JY is a part of the youthful memories jointly shared by us," Weng added. And in a bid to honor their music dream, they plan to throw a concert every year in Pingtan starting from 2016.